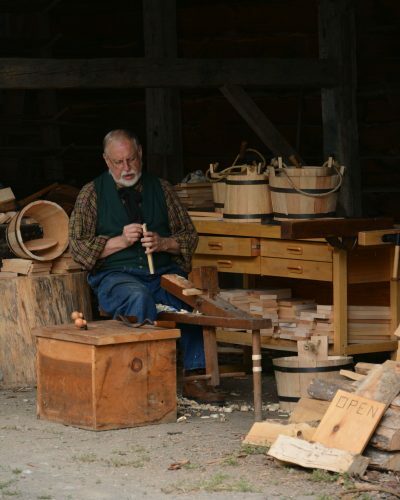 Coopering is the craft in which barrels, casks, and buckets are made out of wooden boards. The boards, called staves, are assembled without any glue or caulk, so they have to fit together exactly to be watertight. The cooper uses geometry, a type of math, to determine the angles at which the staves need to be tapered and mitered. He also uses math to make sure the head, which is the bottom of the container, will fit perfectly between the assembled staves. 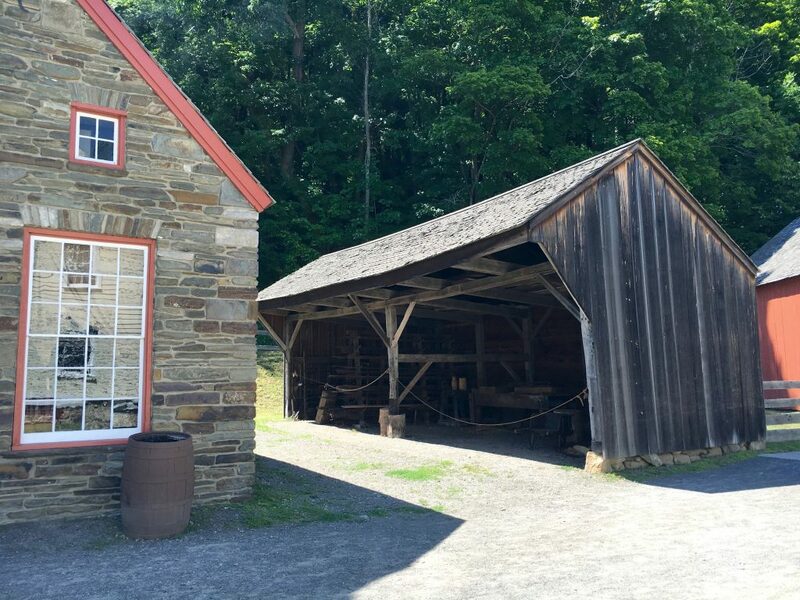 Used for coopering at the Farmers' Museum, this drive shed was once used to house carriages. Farmers' Museum interpreter demonstrates the fine craft of coopering- making wooden water tight buckets. The cooper has to rely on his knowledge and experience to cut the staves to his exact measurements and to assemble them without any fasteners. This craft requires all the strength necessary to cut and shave wood with hand tools and also the understanding of geometry necessary to make the assembly perfectly watertight. Each stave is cut, mitered, and tapered individually using a plane. The number of staves, often fourteen, will determine the angle of the miter so they fit together perfectly. Each stave is then given a slightly curved shape using drawshaves, a tool that shapes the wood into a desired curve for the container being made. The staves are then assembled using two metal hoops, acting as bands, to hold them tightly together. When the last stave is put into place, it provides the tension that holds the whole assembly together. Until then, it can easily fall apart! A groove is then cut around the bottom using a tool called a croze. The head, which is made from an assembly of staves as well, is cut to fit the groove exactly and put into place. 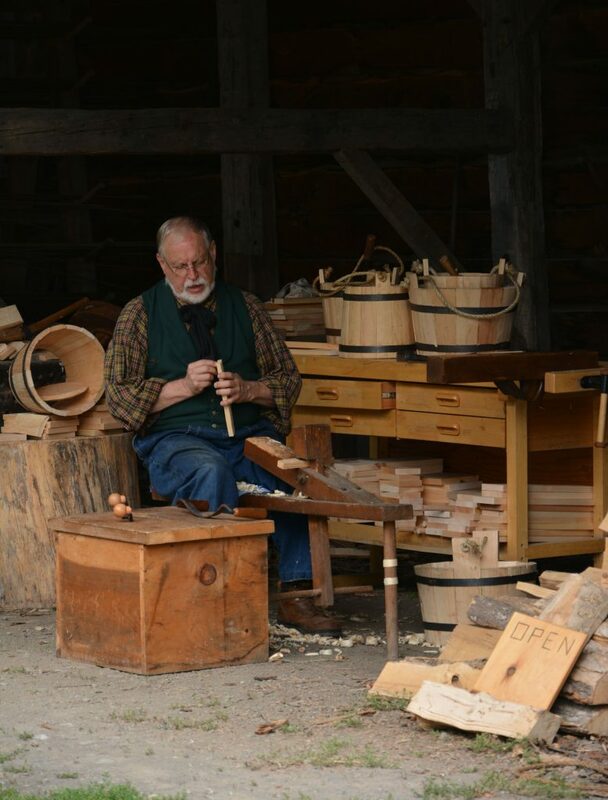 A cooper was someone that made or repaired wooden containers and barrels. 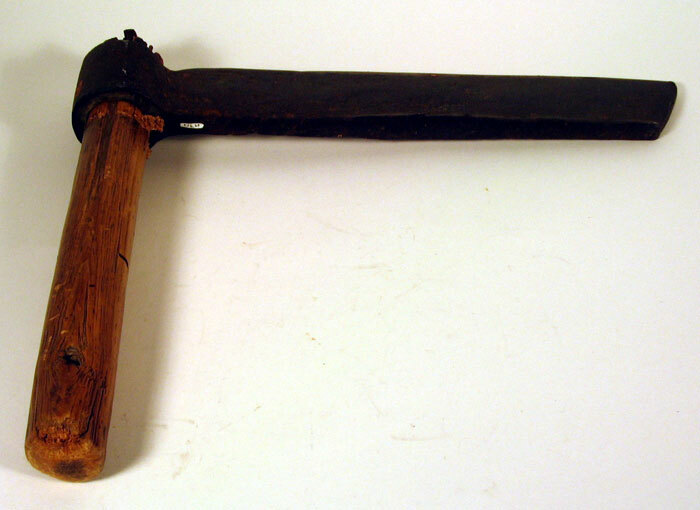 This tool, the concave sun-plane, was used to smooth out the tops and bottoms of the staves after the container was put together. The cooper used a croze to cut a groove into the bucket or barrel so the lid or bottom would fit securely against the wood. 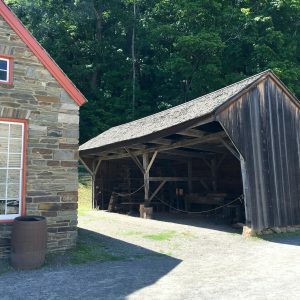 The cooper had to make sure the pieces of wood fit tightly together so none of the contents, such as milk or grain, would seep out.